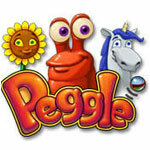 Peggle Deluxe Game Review - Download and Play Free Version! Pachinko meets PC! Take your best shot - ready, aim, bounce! Take your best shot with energizing arcade fun in Peggle! Aim your shooter at a filed of pegs to eliminate each one your ball touches. Make it into a moving platform at the bottom of the screen to get a bonus shot. Eliminate all the orange pegs in 20 shots or less and move to the next round. Conquer 55 fanciful levels with 10 mystical Magic Powers, racking up bonus points and shots you'll smile about your Peggle skill for weeks. Face off against your friends in Duel Mode, or tackle 75 extra-tricky challenges. It's luck and skill and joyous thrills, and amidst all this fevered action only one question remains: Can you become a Peggle Master? 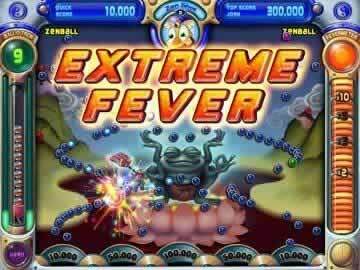 A strange mix between Breakout, Plinko, and Pinball is the best way to describe the addictive puzzle game known as Peggle Deluxe. You control a cannon and must eliminate all the orange pegs and blocks within a level before you run out of ammunition. You'll need skillful aim and a bit of luck to navigate the various layouts and challenges that await. A cannon you control sits at the top of the screen and fires a silver ball downwards into the level. Below the cannon is a large number of colored pegs and blocks. Your goal is to hit all of the orange pegs and blocks (any pegs and blocks struck by the silver ball are removed from the level). Blue pegs and blocks will give you a small amount of points, purple pegs and blocks give you a large point boost, and green pegs and blocks provide a limited number of powerups. Eventually, the ball will fall down into a moving basket or out of the level. A ball landing in the basket will be saved for reuse, while one that disappears can no longer be used. In Peggle Deluxe, different levels are simply different layouts and numbers of pegs and blocks. Despite this, each level presents a unique challenge. Early levels are simple and contain only pegs, while later levels have more obstacles, pegs, and blocks. Additionally, the powerup abilities change as you progress. These powerups can range from explosions that remove a large group of pegs to multiple balls bouncing around at one time. You'll also have to contend with orange pegs that are reachable only by removing blue pegs that sit above them. Pegs will not always remain in one spot either, as you'll quickly discover in later levels. Additional obstacles occasionally present themselves, such as ledges on the side of the screen or moving bars that intermittently block pegs you need to reach. 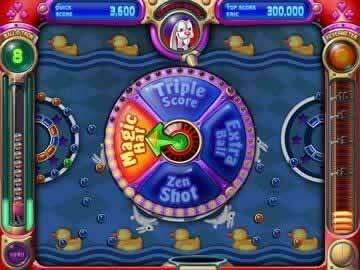 Peggle Deluxe is extremely simple and straightforward game that anyone could play. It is not very difficult, and levels can be redone as much as needed to clear them. However, more skilled players will also find that their abilities can come in handy. Better planning can make it easier to reach all the orange pegs before you run out of balls, or to eliminate enough pegs to earn free balls. These players can also take advantage of the Challenge mode and face even more difficult tasks. The only real downside is the random nature of the game and the big impact it can have. Orange pegs and powerups are randomly placed, meaning the difficulty of a level can change drastically each time. Additionally, after originally aiming and firing, you have no control over where the ball will go. There are a total of four modes available for play in Peggle Deluxe. Adventure Mode is the first you have access to, and completing levels in this mode will unlock them for play in the other modes. Quick Action Mode lets you select a single level to play normally. Challenge Mode adds new requirements and goals to complete the levels. For example, you may need to reach a certain score or clear every single peg (blue and orange alike).The Duel Mode is the multiplayer option. You take turns with a friend on a level you select. You must compete to earn the higher score as you clear the level together. Gameplay isn't the only positive of Peggle Deluxe. The bright and colorful visuals bring an arcade look and feel to the game. Strange characters and backgrounds accompany every level. Each character brings their own music to the levels they appear in. The volume of sounds continues to increase as you rack up points. These elements add a nice touch to the game without being annoying or distracting. The gameplay in Peggle Deluxe is slightly repetitive as you launch your ball and watch it bounce around before repeating it all over again. At the same time, it is a very addicting game that you just don't want to put down. Whether its working towards a new high score, a tough objective in Challenge Mode, or simply the next level, you want to keep playing over and over again. Overall, Peggle Deluxe is an extremely fun and exciting game for anyone. Multiple modes and levels provide a variety of challenges for new and skilled players alike. You can even take on a friend as you compete to earn the most points. Addictive gameplay and wacky aesthetics combine more than makeup for the random and slightly repetitive elements to create a deeply enjoyable experience that you won't want to end. Publisher created game trailer showing clips and characters from the game.